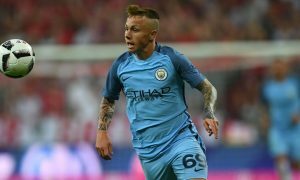 Manchester City left-back Angeliño, who has spent the 2017/18 season on loan at NAC Breda, has been named in the Eredivisie Team of the Year by leading Dutch outlet Voetbal International. The 21-year-old has been the standout player of City’s loan crew in Breda, creating more chances than any defender in the Dutch league since Opta began recording the data in 2010/11. Additionally, Angeliño has been named Rookie of the Month an impressive four times this season, most recently picking up the April award. His performances over the season have won him a place in an XI dominated by players from champions PSV Eindhoven. Ajax centre-back Matthijs de Ligt, heavily rumoured to be a target for Pep Guardiola this summer, joins Angeliño in the backline – could they play together at the Etihad Stadium soon?